Need GE Profile WPDH8800J Steam wasing machine Reviews & Ratings? The GE Profile WPDH8800J boasts colossal capacity at 4.2 cubic feet, making it one of GE's largest capacity front loading washers. The huge capacity can wash 50 adult sized T-shirts in one wash. At a $1,200 list price, the 8800J will save you a few hundred dollars compared to the 8900J, with many of the same features. This pricetag and product represent good value. Washer highlights include SmartDispense technology, incorporated in pedestal, which automatically houses and dispenses up to 6 months worth of laundry detergent (Powder or liquid) and other washer fluids. This eliminates the need to add detergent for each individual wash. You select your cycle and even tell it what type of stain you have. Then, press start. That's it. It figures out temperature, time, and even the amount of detergent. This laundry machine is Energy Star rated and is rated at 191 kWh/yr, which is very efficient. 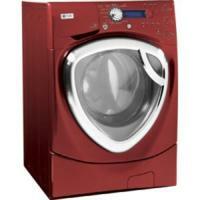 The WPD8800J also has GE's H2ition system which senses laundry load size and adjusts water levels appropriately. One of the most expense portions of the wash cycle is the drying phase. The GE 8800J reduces required dry times by spinning clothes at a blazing 1,300 RPM, removing excess moisture. If you purchase the compatible GE dryer, this washer can communicate electronically, via CleanSpeak technology, to instruct the dryer on proper settings based on the type of clothes you just washed. Cycle times are 80 minutes, well below average. Read on for more feature reviews. #1) Huge Capacity: Among all its features, the GE WPDH8800J's 4.2 cu. ft. of space allow you to wash up to 50 adult T-shirts in one wash.
#2) Energy Efficient: Uses only 191 kWh/year. Similar models can run up to 700kWh/year, so the GE WPDH8800 is well below this maximum which will translate into immediate savings. This also helps this washing machine meet ENERGY STAR Qualifications. #3) Low Noise & Vibration: Most users commented on the washers low noise and vibration levels making it ideal for thin walls. #4) High Spin Speeds: At 1,300 RPM this laundry machine is about as fast as they get. Look for high spin speeds if you want to reduce dry times. Because dryers tend to be reel energy hogs, this is a true benefit from an annual cost savings perspective. #5) Great Cleaning: Stain inspector system allows you to treat over 40 common stain types. Custom cycles for various fabric types to help prolong clothing life. Steam assist penetrates deep to get out the toughest of stains. #6) Smart Technology: Automatic detergent dispensing pedestal eliminates the time and mess involved with adding fluids for each wash. GE claims the pedestal can hold up to 6months worth of detergent. H2ITION technology senses load size and adjusts water levels accordingly. GE's patented CleanSpeak technology allows the washer to communicate with its compatible dryer to adjust for appropriate drying procedures. #1) Extra Costs: Some of the GE WPDH8800's features come at and added cost. Among these are the automatic detergent dispense, which can only be used if the proper GE SmartDispense pedestal is purchased (Approx $600.Ouch!) CleanSpeak technology (Explained Above) can only be used with the compatible GE dryer. 2.) Good Gentleness: All the features used to fight tough stains can put added stress on your clothing. Great washing machine opiton in the $1,000 to $1,500 price range. It offers a ton of features and GE quality and should be a serious consideration for anyone with the budget and need for large capacity and great cleaning power.